A standout motherboard for Intel's Coffee Lake CPUs. The Z370-G's smooth, clean style, solid performance, and intuitive BIOS make it a standout choice. Motherboards like this don’t come around often. Perhaps it’s due to Coffee Lake’s minuscule power requirements, or maybe because Intel’s mature platform needs little iteration between generations, but the micro-ATX form factor doesn’t seem to get much love from mobo designers. Which is a shame, because it’s a perfect combination of form and function. Just take a look at the arsenal attached to this 9.6-inch square of PCB joy: two M.2 PCIe SSDs, six SATA 6GB/s ports, dual PCIe x16 slots, USB 3.0 header, five PWM fan headers, and support for 64GB of DDR4 running all the way up to 4,000MT/s. Pretty snazzy. It’s not a huge amount, but it’s more than enough to forge any number of RAID arrays, run SLI and XFire configs, and pump a decent amount of airflow around all at the same time. It’s a beautiful thing to be so perfectly balanced, and the industry seems to have forgotten just how important such balance is. It’s ironic, really, when you consider how much we’ve moved away from pure performance, and leaned more toward power savings to try to balance our semiconductors more. That aside, Asus’s ROG Strix Z370-G motherboard is a solid choice on more than just form factor and function. Let’s talk aesthetics. The bare-bones brushed steel look, littered with stripes across the board, looks crisp and sharp. What limited RGB lighting there is, is confined entirely to the logo on the chipset. There’s no rear I/O cover, no audio cover, no armor. It’s nice and simple. Yet, surprisingly, it’s still sophisticated because of it. It’s one of the main reasons we chose this board for last issue’s “Build It” feature. Trying to decide what motherboard you need for your next gaming rig? 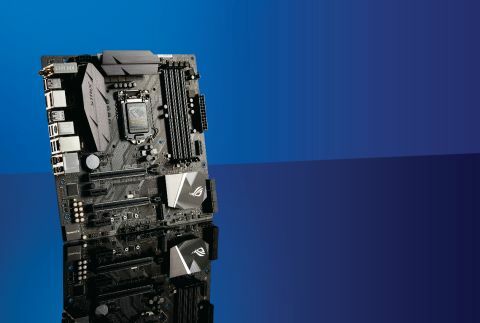 Check out our guide to the best gaming motherboards. Nowadays, building a themed black and white system is no easy feat, especially given the level of RGB and lighting baked into almost everything. So, the subtle lines and color of components really made this board stand out against the other options currently available. Admittedly, we didn’t have a whole lot of choice—a meager three micro-ATX form factor mobos sit in the Z370 space right now, so it was hardly a tough call, but still. As far as performance is concerned, the Z370-G falls exactly where you would expect it to. Asus’s Z370 philosophy is still pretty resolute: Power draw is quite high in contrast to the competition, along with clocks edging up ever so slightly because of it. That’s not so great when it comes to temperatures, but it is good for stock performance. In Cinebench we saw figures hit the 1,539 mark, and X265 hit 30.47fps, compared to MSI’s Z370 Godlike Gaming which managed 1,422 and 28.32 respectively, albeit at far lower temps than Asus’s power-hungry offering. That aside, there’s little to report—performance is exactly what you’d expect from a Z370 motherboard. Ultimately, then, if you’re after a micro-ATX motherboard on the Z370 platform, the Z370-G is likely your best bet. Its smooth, clean style, solid performance, and intuitive BIOS make it a standout choice, and the best of three in a world of slim pickings.